Every time come to this shop, Mamarazzi sure will order Hokkien Mee. No other thing ka? Am getting bored with it leh. What is that stall selling? Looks like got rice and soup. Wanna try. Double boiled Old cucumber soup. Very tasty. Though can't see much ingredient in this but can taste the genuine sweetness of the Red Dates and the dried squid. Hmm...here comes the "Ku Low Yuk Rice". 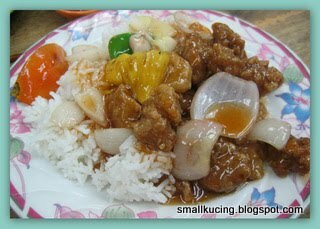 Is it called Sweet and Sour Pork in English? Very generous heaping of pork. The pork taste very good too. No "sou" smell. Price was RM5. Reasonable. Next time going to try other dishes. Let Mamarazzi eat Hokkien Mee. I just had old cucumber soup yesterday and now I'm craving for it again after seeing this. Need to have a fix tomorrow! wow... u really go makan a lot. :D have u ventured the shopes in sunway kota damansara yet? i love food wrapped in banana leaves. soup looks nice...i love soups...! the HKM really look nice woh, so thick and so oily (that's the best for HKM right??).. and then the GLY rice, really the pork is more than the rice lor, hahahaha.. 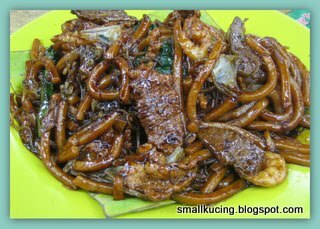 I used to love Hokkien Mee but avoid eating too much now 'coz it's very oily! What happen to Smallkucing's neck, it looks pinkish? FIrst time for me to see Hokkien mee with banana leaf. How much is their plate of Hokkien mee? Make me want to eat Hokkien mee now... I missed it... hmm... Maybe can persuade hubs to go later hahaha! 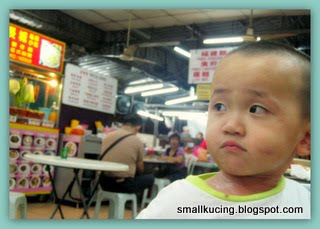 Yes, we makan at K. Damansara also. Saw your post on the crab there. LOL...eat once in awhile is okay one la. Cannot worry too much...now chicken have bird flu, fish got mercury, beef got mad cow, pork got swine flu, vege have pesticide, water have....and so on...how? kakaka.. This HKM not as oily as the Jln Hang Tuah one. 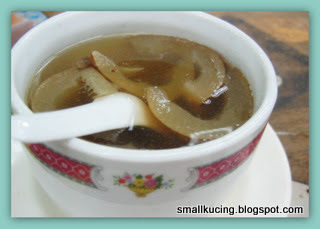 The Jln Hang Tuah taste very good also but very oily when compared to this. The Hokkien Mee is so tempting leh.. Some more serve in Banana leaf.. never go this place before.